CM Magazine: Christopher Changes His Name. (Growing Reader Level 3). Christopher Changes His Name. (Growing Reader Level 3). Christopher was on his way home from school. He was having a bad day. The sky was a dark, angry grey-blue and it was raining all over everyone. Christopher splashed through the puddles feeling just as miserable as the day. He was in a bad mood because he hated his name. It wasn't a special name. Millions of people all over the world had that name. There were eleven Christophers in his school and three in his class! 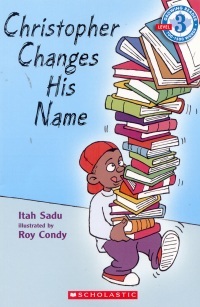 It is not hard to imagine that all kids have had an "I hate my name!" thought at least once in their lives. So it is quite conceivable that children will be able to relate to, and laugh at, this young boy who hates his boring, commonplace name with a passion. In this entertaining little book, readers meet Christopher who despises his name and decides to change a mundane name into an extraordinary name, one that is uniquely memorable. He tries a few: "Tiger", after a famous Trinidadian strong man; "The Real McCoy", even "23", after his favourite basketball player. All his friends thought these were great names and even wanted to change their own. His teacher and his mom thought it was all a bit foolish. 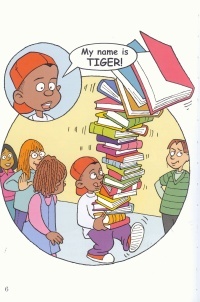 One day, however, Christopher/Tiger/Real McCoy/23 learns that using your own name can be very important in dealing with real life problems. Teachers may want to use this book to help students to understand that, although made-up names can be fun, they still must be responsible in the end. This book is a Level M (mid-grade 2) book with 1002 words.